Parksite associates gather together with representatives from A Kid’s Place at the presentation event for the playhouse donated by Parksite in celebration of its 40th anniversary. Thanks to Pope’s Utility Buildings, the playhouse was delivered recently much to the surprise and excitement of the children. Children at local emergency foster care facility, A Kid’s Place are now enjoying a brand new well-constructed playhouse thanks to the generosity of a local building supply company which celebrated its 40th anniversary by building playhouses for charity. “The eagle has landed,” was Parksite’s Senior Business Analyst Pete Wheeler’s exclamation as he delivered the 64 sq. ft. blue playhouse complete with counter tops and front porch to the Brandon-based emergency foster home. 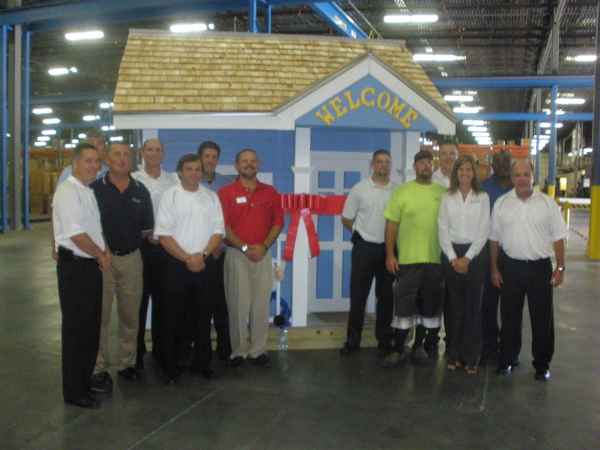 Twelve associates in the Tampa branch of the employee-owned sales, marketing and distribution company spent five weeks of their spare time building and decorating the playhouse. The house was built at Parksite’ s offices, located at 4545 Madison Industrial Ln.. in Tampa and delivered to A Kid’s Place located at 1715 Lithia Pinecrest Rd. in Brandon. A big thanks to Pope’s Utility Buildings who offered the equipment and manpower to have the house delivered. A Kid’s Place, was chosen from a list provided by company headquarters, according to Wheeler. branch received $5,000 and used the company’s high quality products to build the house. For the delivery, Wheeler decorated the blue house with special balloons characters (a talent he picked up while doing missionary work) and was thrilled at the joy on the faces of the children at the facility. A Kid’s Place Resource Coordinator Mary Berg and Systems Navigator Jessica Garcia were invited to a presentation of the house at Parksite weeks prior to the delivery. Unsure of what they were to be presented with and armed only with an awareness of a donation, Berg and Garcia’s jaws dropped when they walked into the garage and saw the house. A Kid’s Place, a licensed, residential group care provider, is a unique, state of the art, 60-bed facility for abused, neglected, or abandoned children. A Kid’s Place has five 3,200 square foot homes, located on 5 acres in Brandon, FL and located on Lithia Pinecrest Rd. For more information, visit www.akidsplacetb.org or contact them at 381-3839. In addition to the playhouse in Tampa, seven additional branches of the company built playhouses to donate to charities in their respective areas. Labor on the playhouses was voluntary for associates but all materials and choice of blueprints were supplied by the company. Materials included Corian® countertops, AZEK® Trim, Crown Columns, Nichiha Brick Panels and DuPont™ Tyvek® products. Parksite is an employee-owned company providing sales and distribution services within the building materials supply chain. For more information, visit www.parksite.com or contact the local office at 1-800-237-0229.